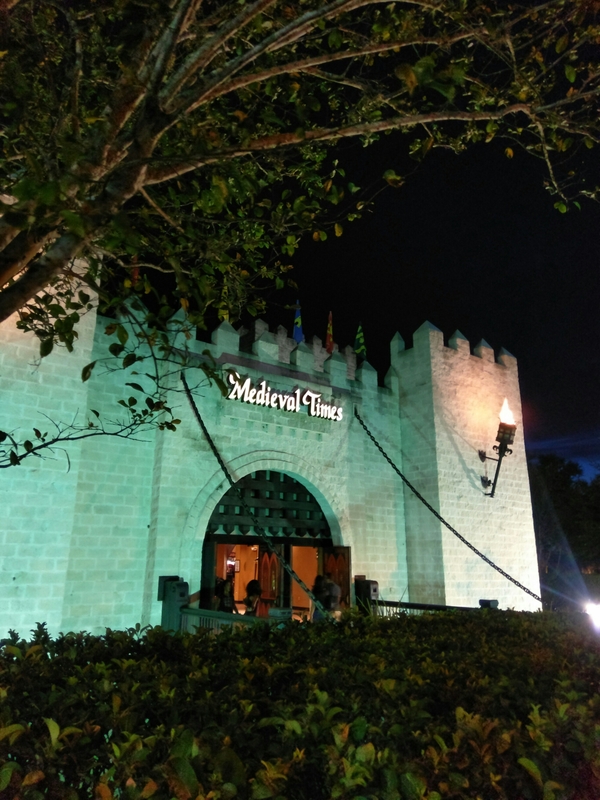 Imagine being thrown back in time to a land of castles, medieval banquets and jousting! 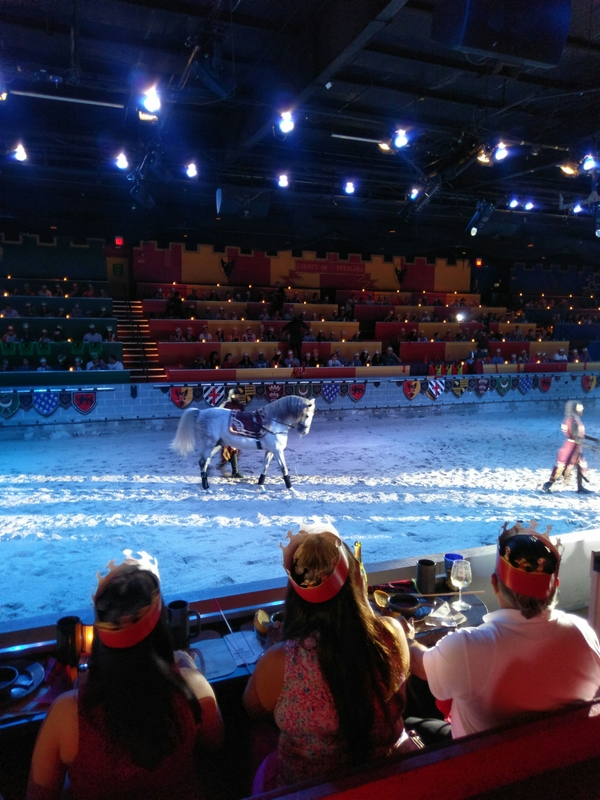 This is exactly what we found ourselves doing at Medieval times in Kissimmee, Orlando. The entrance itself is impressive with the whole building done up to look like a castle. You know you are arriving somewhere special! Once inside and checked in you are given a hat and banner in the colour of your knight and shown to your seats. We booked the royalty package so had really good seats and little towels to wave as well as our flags. Our knight was the red knight. The seats are around the edge of the huge room in coloured sections, with a big sand arena in the middle. 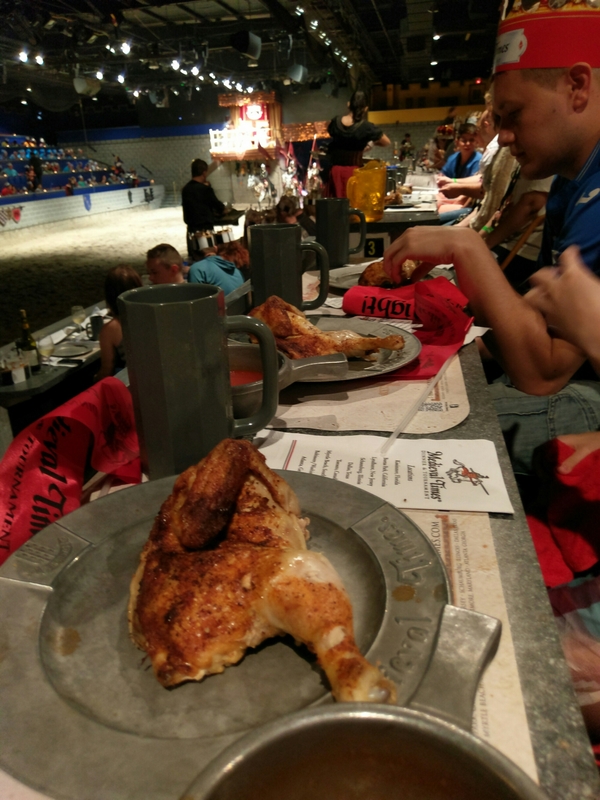 We were served a medieval meal during the show that consisted of soup, huge chunks of chicken and potato, dessert and coffee. You drink from goblets and eat with your fingers off of big metal plates. All food and a variety of non alcoholic drinks are included. 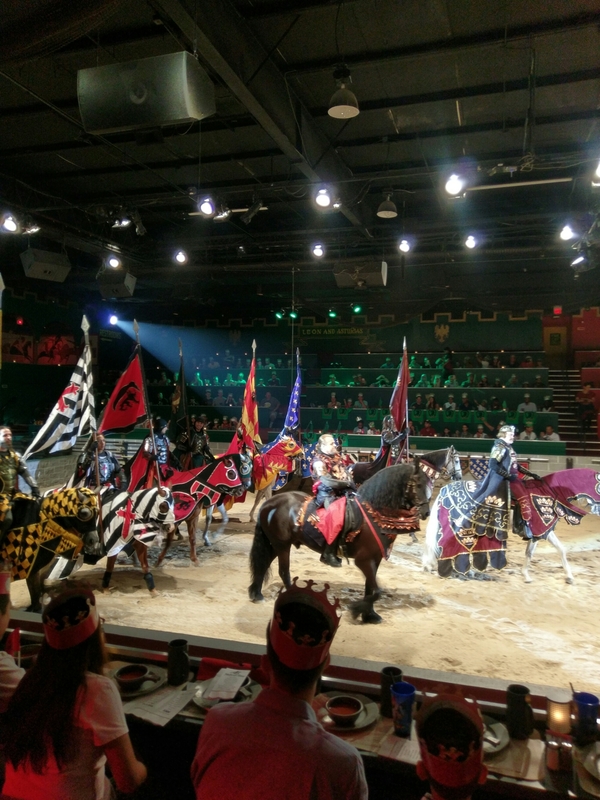 The show itself is amazing with beautiful horses doing tricks, knights jousting and fighting and even a King and Princess! 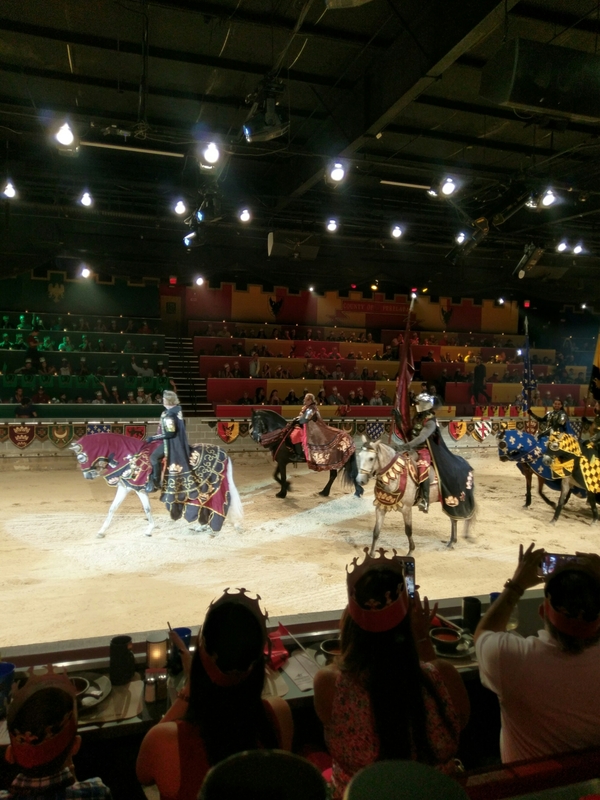 The audience are encouraged to get involved, cheering for their knight and it is great fun! 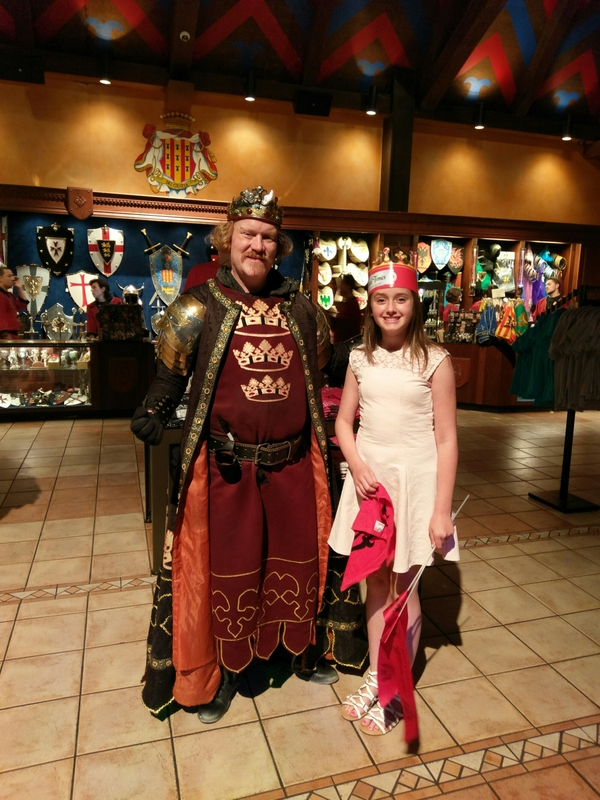 After the meal and show there is an opportunity to meet the Royalty and knights and take photos. There is also an optional souvenir photograph to purchase. 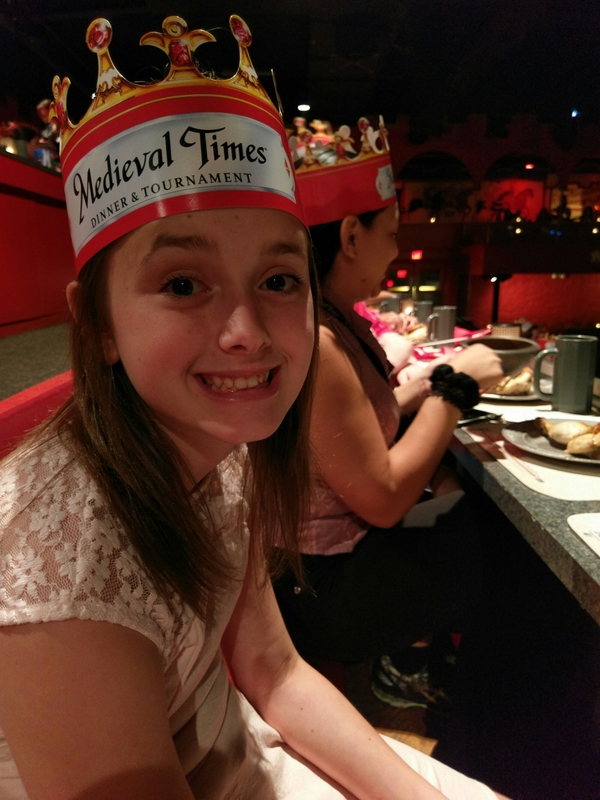 Medieval Times with an autistic child? It is loud, we take ear defenders. There are lots of people, but you don’t feel like you are in the middle of a crowd because you are looking out into the large arena. My son is used to going to dinner shows and actually loves it. There is lots to watch and he loves animals so the horses are a big plus. He struggles with a knife and fork so eating with his fingers isnt a problem! You can walk past the photographers and avoid having pictures taken. It is two hours long but there is a lot to watch and food to eat. There is a shop area which is quiet during the show if you do need to take some time out.